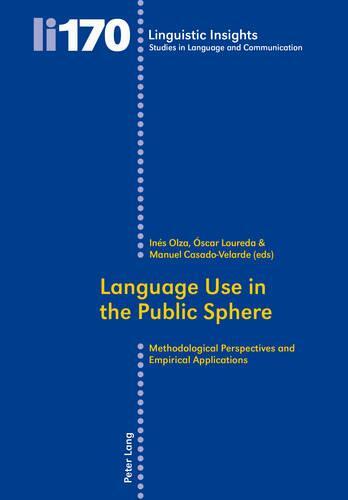 This book comprises a range of general discussions on tradition and innovation in the methodology used in discourse studies (Pragmatics, Discourse Analysis, Argumentation Theory, Rhetoric, Philosophy) and a number of empirical applications of such methodologies in the analysis of actual instances of language use in the public sphere - in particular, discourses arising in the context of the debate on the presence of religious symbols in public places. "This is a timely, scholarly edition that will have an impact beyond the academic community. As everyone has a vested interest in the fairness and sincerity of debates about religion in the public sphere, this volume is to be welcomed as a thorough, detailed scientific examination of what can be often emotive issues. Its dispassionate and rigorous style serves as a prompt to remind us that we ignore truth at our peril in an age when religious controversies will persist." >BR> "Overall, this book is noteworthy for the broad sample of religious and cultural areas in which the central phenomenon of religious presence in the public sphere is explored. This clear and insightful volume should certainly help readers gain a deeper understanding of the issues in this debate, and provide the perspective needed in order to assess these difficult questions objectively."